So I made some bars a while back and they tasted fine, got great reviews from family members who tried them and the kids ate them. But they were still lacking in texture. 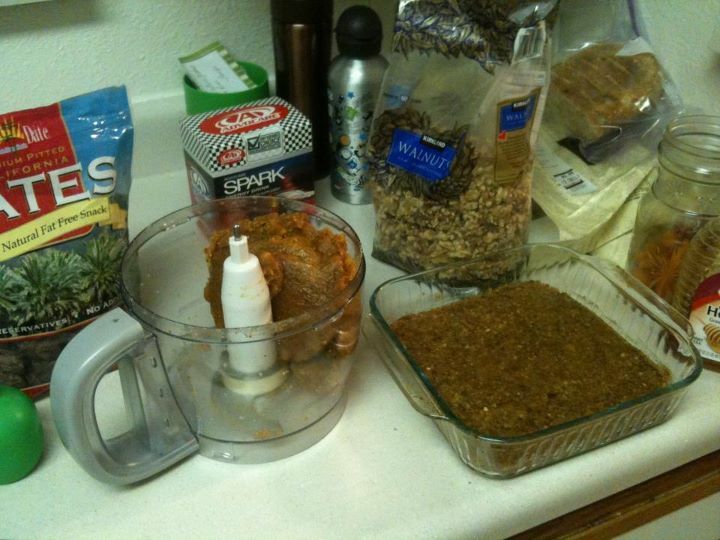 So I more recently made the no-bake pb bars… those were really good too… but also still lacking something. Tonight I tried yet another attempt. This time without a recipe. I just sort of eye-balled amounts and used my heighten mommy sense of smell. The kids loved them all, probably the best of any that I have tried making so far. 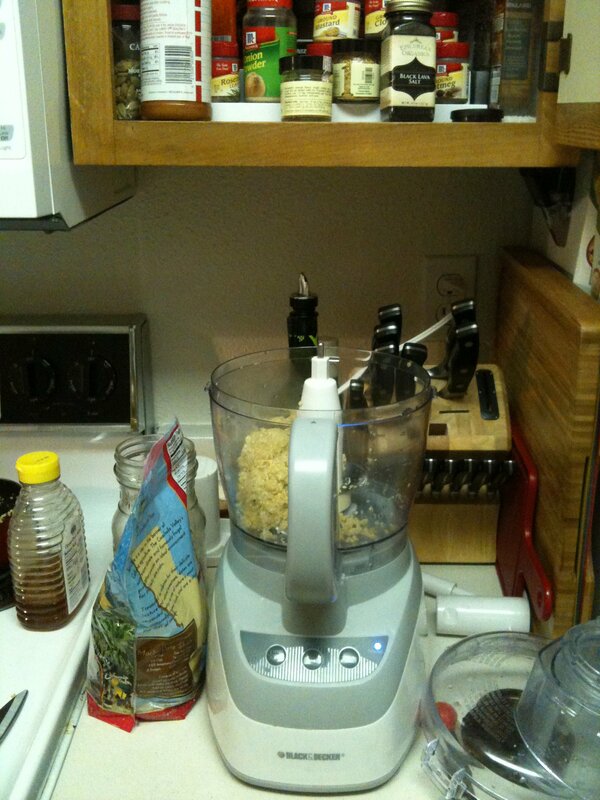 I used my food processor (thanks to the suggestion of a wonderful friend), and blended nuts and dried fruit with honey. 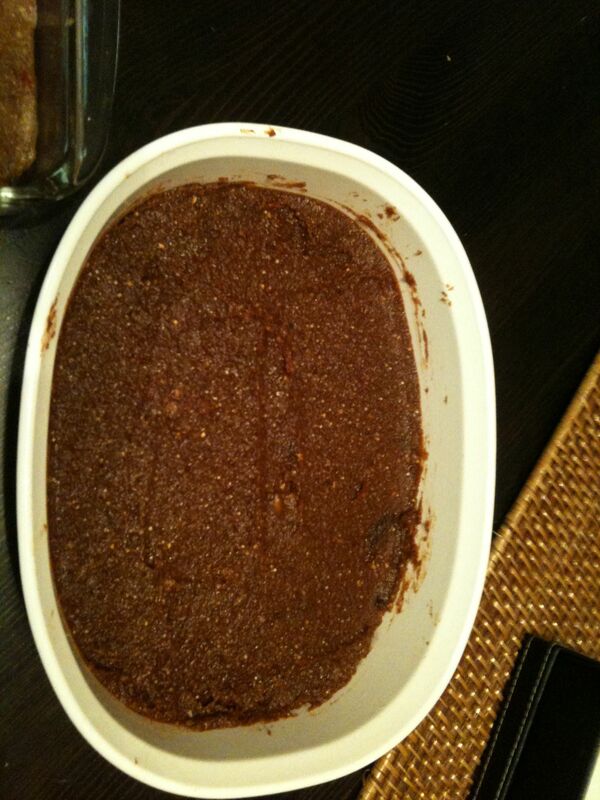 My first batch (already in the dish) was dates, walnuts and honey. They are good. My second batch was apricots, dried strawberries and walnuts with a pinch of orange zest and a tiny splash of vanilla. This is the favorite so far, and the best texture. My third batch was inspired by my daughter’s class at school, where nuts are totally banned. I want to find something I can pack in her lunch that won’t set off any allergies… so this one started with cooked quinoa. Because quinoa tends to have such a strong flavor I kinda went over board with the “cover up” and added apricots, strawberries, dates, and chocolate powder with a splash of vanilla. My husband calls this the “conflicted” bar… it doesn’t quite know if it’s supposed to be healthy or chocolate covered fruit salad. 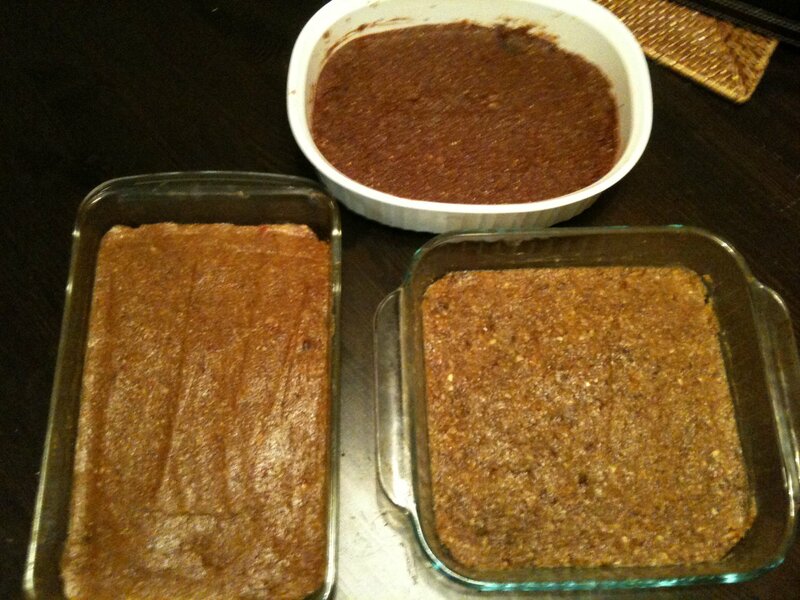 My three attempts at bars… Pure and Simple in square, Sweet and Yummy in rectangle, and Conflicted in oval. The texture is a lot like a Lara bar, or similar to some of the Cliff bars. Here we go with week 3 of not shampooing. So far, I am still amazed. Both my hubby and I have experienced more of the greasy looks this week, so we applied the baking soda/water rinse. It was incredible. I have also noticed my scalp is a lot healthier – less flaking and itching. In all, we have had such amazing results that I am contemplating taking the kids off of shampoo. Haven’t gone that far yet, but after reading up on a few ingredients that were confusing me, and finding a “no poo” website stating some of the same things, I really just may! A very resourceful site – I just recently came upon this one. My first intro into the idea of not shampooing was a friend who told me about it. Her hubby did it for a while and had great results. At the time I was not fully engaged in the idea and just nodded politely. It took websites, a magazine (possibly Ladies Home Journal?? It was at the gym while running) and my hair dresser to get my attention. What started as a simple conviction several years ago has slowly grown over time. Now, however, I have to laugh as it seem we are entering a new phase altogether: Hippie-ville! With only one child at home during the school days and feeling the healthiest and most energetic I have felt in years, I have been able to pursue this conviction a bit further… and it has taken some interesting roads so far! This week’s ventures: Chap stick and energy bars. 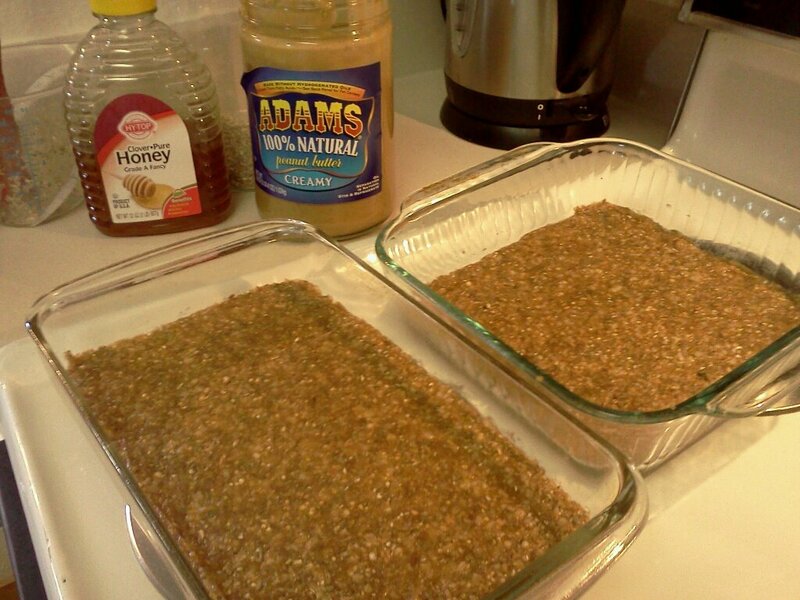 Energy Bars: This was a super quick (total time involved, including a few interruptions, 15 min) and easy recipe. It calls for uncooked old fashioned oats, which I don’t have. I used cooked steal cut oats and uncooked 7 grain cereal (the kind that needs cooking) in it’s place. The kids are raving about them. Personally, though, I still feel like they need some tweaking. However, the “no bake” method won me over!! Everything went into my 1 cup pirex measuring up, into the microwave for 30, 20, and 10 second intervals as the beeswax was melting. 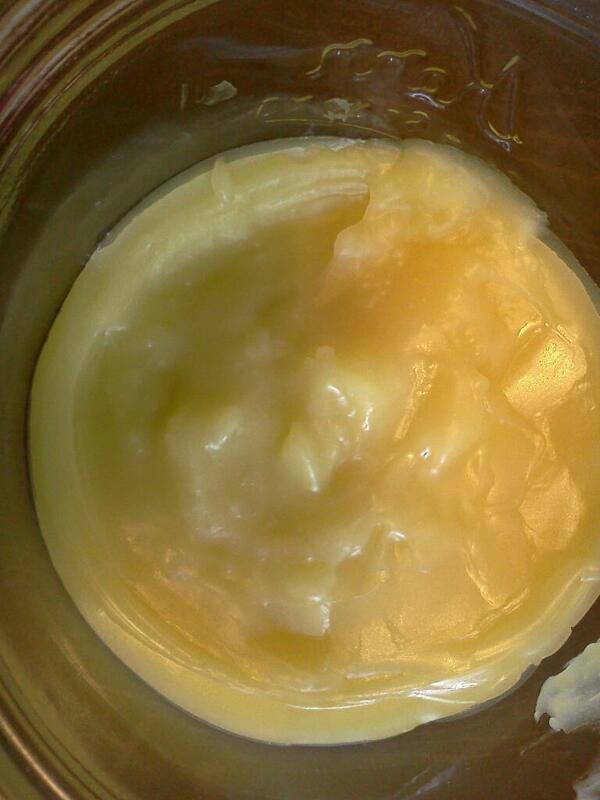 I added vitamine E & essental oils after the wax was melted with the olive and coconut oils. Poured it into this jar and was able to use it almost immediately. And again, my kids LOVE it. Primarily my son who has trouble with dry, chapped skin especially around his mouth. (I used tea-tree essential oil for my son’s issues with his lips, and peppermint essential oil.) It really does have the same texture and consistency as the chap stick you’d buy at the store. And, when my empty tubes arrive in the mail, I will be able to make 7 tubes of chap stick for less than $3.50, instead of buying an 8-pack in the store for $12. His weight is warm and comforting in my arms, and again my heart feels that so familiar pang of joy. I get to hold my baby boy. I get to. And today, his second birthday, I marvel at this privilege for the millionth time. This 2 year old gift we did nothing to deserve. This child we were told we might loose. I think back two years ago… The look in her eyes is one I will never forget. Only her lips smiled politely as she placed the dopler back in its nesting hook and told us that the Doctor would be in to review the ultra sound with us. In each of my pregnancies before we’d been ushered back into the appointment room. This time I was asked if I needed to use the restroom and politely told to wait on the ultrasound table. I still feel the chill of those doctor’s words as we were shown fuzzy ultrasound images that afternoon. The second ultrasound, a much more high tech one located in a specialty clinic, confirmed that doctor’s suspicions. We were set up with a genetic counselor and advised to have an amniocentesis done. We were told our tiny son had a 1 in 5 chance of surviving birth. That from what they’d seen in the ultrasounds the odds were not very good ones. That it was likely one of two things. That we should be praying for the chance of survival in the lesser of the two. Tests done and more ultrasounds later, we were told of our miracle over the phone. They didn’t know why he had the markers they spotted in the ultrasounds, but for whatever reason, the deformities were not life-threatening, for him. His chromosomes are clear of extras and dangers. They were cautious still, worried about a deformity of his umbilical chord, prescribed weekly testing and ultrasounds and post-natal follow ups for his kidney. And when he is born, ten days early, carefully monitored, and 2 hours and 45 minutes after the doctor started pitocin: when he is all purple and slippery on the bed in front of me, having come into this world before the doctor could get to the room and before the nurses could prepare for him, before I could take anything for the pain of it: time pauses for this briefest glimpse. This tiny shivering life before me. This miracle. I can hardly take it in. We have friends who have welcomed their babies into the world to say good bye. We know friends and family members who live between doctors and therapies, their babies born with extra challenges and struggles. We have stood over caskets and comforted loved one, marveled at progress and counted developmental stages finally reached by young ones struggling for more normal health. Yet, here we are. Our son turns 2, full of life. Full of health and living and laughing and pushing limits and buttons and spreading patience thin. Rarely does a day go by when I don’t think about these things, when I don’t pause, overcome by the immensity of our gift. We did nothing to deserve this mercy pass, this escape from grief for ones so young. And I scoop up my laughing toddler, nuzzling his chubby neck, breathing in his air, his joy. I simply cannot take this precious gift for granted. Having stood on that ledge of daunting possibilities, looking over the edge of our son’s future unknown, knowing those who have lost – I can’t forget. That feeling, that fear, that grieving, that unimagined relief at such a humbling miracle. All that is encapsulated in this word, miracle. Gifts we enjoy from these two years past: his ear piercing scream of joy or anger, his wild belly laugh, his smart capricious blue eyes, his aim and love for throwing, his voice and smart little words, his wet kisses and suffocating bear hugs, his love of pizza and treats, his adoration of his big brother and his smitten love for his big sister, his dance, his walk, the way he snuggles right in at night, his large head that often gets used and a weapon – much to his delight, his “pleases” and his “thank you’s” and his “I love you’s” too, his tough guy stride and tackle, his blanket – the one he picked out at the store when he was 8 months old, his Coca Monkey that makes all things right, his “nokia” and “Momia” and “Dadia” and “Mikey-a” and “potty-a” and “puppy-a” and “Nonia” and “Elie-a”… and so much more. The purple-taupe color of the garlic clove skin. Green fresh smells of early mornings, sunny in the in-between of summer and fall. Box fans that blow air in the heavy heat of late afternoon. Fresh bread filling the house with floury homeyness. Creamy vanilla lotion on cracked work worn hands. The sparkling iridescence of pool water inviting a big splash in the early evening after school. Lentil soup with garden fresh veggies and thick slices of homemade bread. Anticipation of a loved-one’s return, the comfort of strong arms and chest, the warmth of hugs and tenderness of kisses and joy-filled laughter of children jostling for their turn. So, after hearing from several different reliable sources my husband and I decided to try the no shampooing thing. I have to admit I am pretty impressed. We were warned to expect less than satisfying results within the first 2 to 4 weeks, and while there is definitely a transition happening for both of us, I am really shocked by how well my hair is suddenly behaving. The oily look has not taken over. We are showering daily, rinsing and massaging our heads as instructed. I still use conditioner occasionally and I am still using my styling creme – but need a whole lot less to accomplish the same control. My husband says his hair is laying down easier with less gel, “It’s not trying to escape from my head like it usually does,” were his words. And, we are working out in the gym on an almost daily basis… so, yes, we are very impressed. 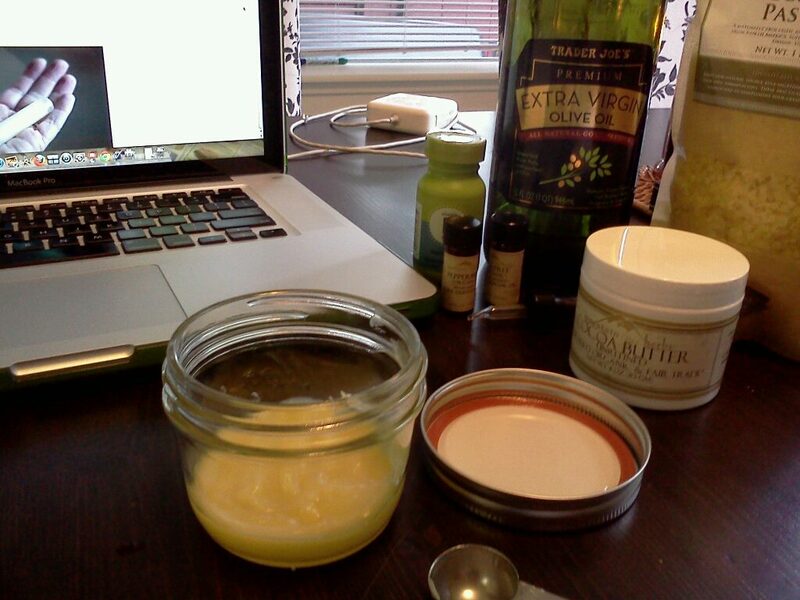 I have also made our own lotion – which we both love. It is creamy and rich, and absorbs easily. And it was so simple! All in all, this week of making more foods from scratch (my amazing husband made nachos, making the chips from scratch first! ), lotion, deodorant and going without shampoo has been rather rewarding. We may just keep trying more new things :). Friday mornings are for a slower pace. For comfy clothes and workout shoes. For a few extra minutes of sleeping. For lingering longer at the breakfast table, Bible in hand, family together. For dreaming up weekend plans and sorting out details for an evening of celebrating a week of work. For longer hugs and a few more kisses. For savoring a weeks long work well done, and preparing for a day of rest. 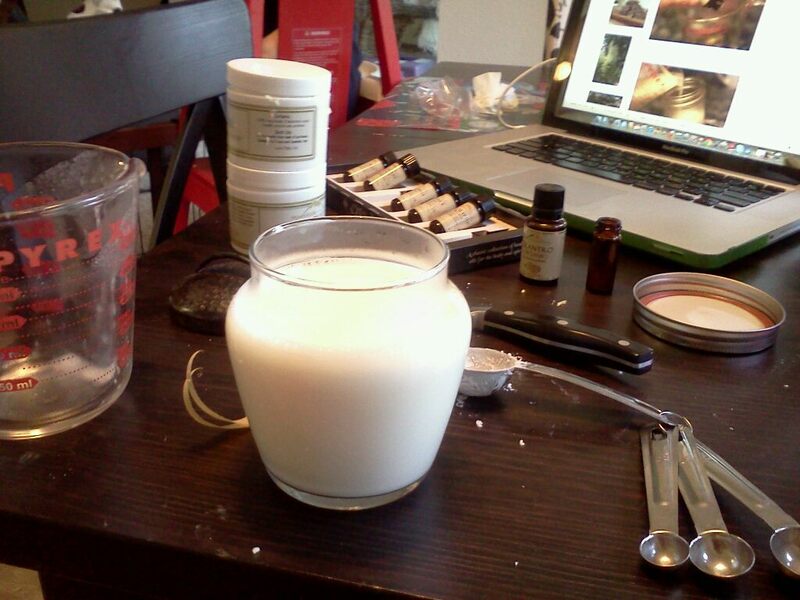 My first batch of lotion was surprisingly easy! 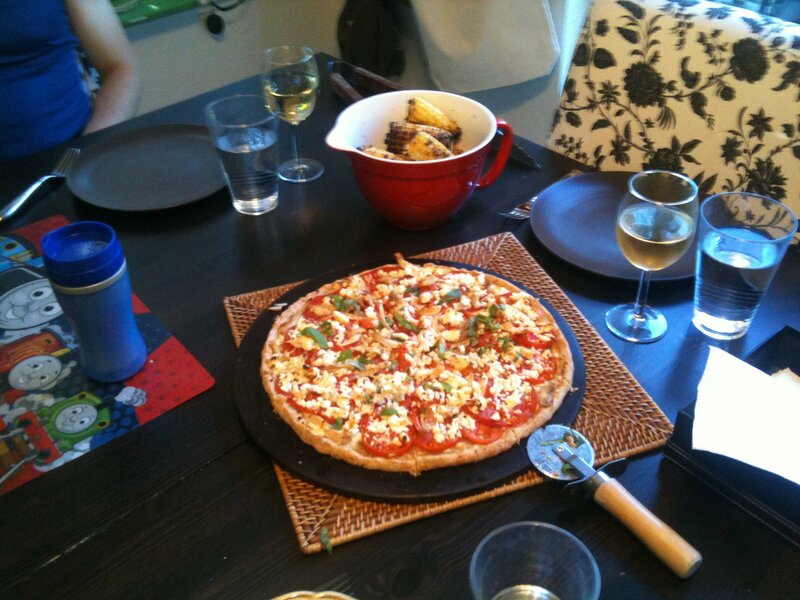 And I put it together in less than 10 minutes… Click here to link to the recipe I used. I replaced the olive oil w/ coconut oil because that is what I have plenty of. The best part is that aside from the emulsifying wax and essential oils I already had everything in my kitchen that I needed. (I ordered my emulsifying wax here and they also have essential oils). I am so excited to try another batch! *I used mexican blend cheese instead of sharp cheddar in the crust, because this was all I had. *I used the whole egg instead of just the yoke, as I am not going to need an egg white anytime soon, and I am extremely clumsy when it comes to separating the two. *I only used 1 pound of tomatoes, and added roasted chicken because I had it on hand. This was extremely easy and an “all-in-one-dish” sort of dinner that was demolished by my husband and children, even the one who dislikes tomatoes! The corn was drizzled with olive oil and rubbed lightly with sea salt and cracked pepper, then put on the BBQ for about 15 minutes. It also disappeared.